Correction: An earlier version of this story incorrectly noted that the street proposed to be co-named was Lispenard Street, rather than West Broadway. The address of the sign would be 1 Lispenard, at the corner of West Broadway. It has been 13 years since a sniper’s bullet ended the young life of Staff Sgt. Jimmy McNaughton as he stood watch in a guard tower outside of Baghdad. 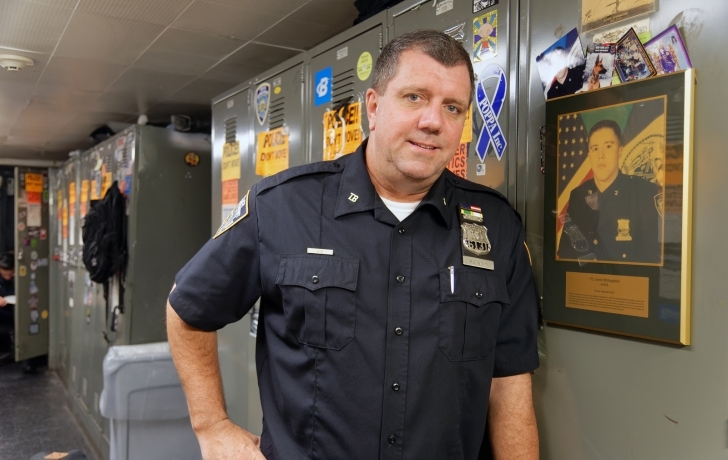 But in the subterranean headquarters of the NYPD’s Transit District 2, the command where he had also served, Police Officer Jimmy McNaughton lives on. On a wall of the TD2 quarters, housed in the A,C,E Canal Street station, he is memorialized with a bronze plaque, and a painted portrait with Army rifle in hand and NYPD cap on his head. McNaughton’s locker holds some of his personal effects and is permanently sealed in his honor. A picture of him hangs on the door. Now the former transit officer, the first NYPD cop to be killed in Iraq, is due to be publicly honored in Tribeca. Pending expected approval by the City Council, West Broadway, between Lispenard and Canal Streets, will be co-named James McNaughton Way. The new street sign bearing his name will be placed at the corner of Lispenard and West Broadway, near the subway entrance that leads to the Transit District 2 station. Kenny and Caracci came before Community Board 1’s Transportation Committee this month to seek advisory approval of the co-naming for McNaughton, who was 27 when he died. It was an easy sell. The committee not only gave its consent, but capped it with applause. Kenny recalled the events leading up to the death of McNaughton, who was one of three military police, all cops back home, who were training Iraqi police officers at Camp Victory. With snipers in the area, Kenny said, McNaughton volunteered for the dangerous guard duty, reasoning that he was single while the other two men had families. In the Army, McNaughton had first served a tour stateside before joining the NYPD in July 2001 and patrolling the subways of an on-edge, post-9/11 city at night. With the Iraq War raging, the Reservist was redeployed. McNaughton’s parents, William and Michelle, both retired transit officers, said in phone interviews that they hope the sign will spark curiosity in those who see their son’s name, and Google him to learn about who he was.